But, I rarely see it used in recipes today. Why is that? I really don’t know. I think I’m going to singlehandedly bring it back. Why not? I can either buy expensive, allergy-friendly chocolate, or I can buy cheap dairy-free chocolate that has soy lecithin yuck) in it, or I can buy unsweetened chocolate and completely control how much sugar gets added. Score! You see, when I make cookies for other folks, like these I made today, I always use more sugar than if I were baking them for myself. I’m used to bitter chocolate. Other folks generally prefer a bit more sweet. Today’s cookies are part of the Pass The Plate chain started by BeBetsy. It’s a fundraiser supported by KitchenAid. 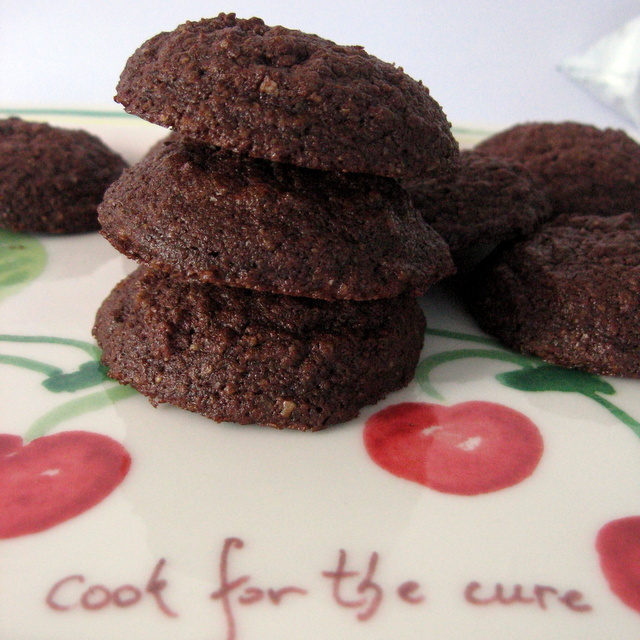 Each time a blogger makes cookies, blogs it, and passes the cookies and the plate along to another blogger, KitchenAid donates $5 to Susan G. Komen for the Cure®. I got the plate from the creative and fun Johnna, of In Johnna’s Kitchen. She made some totally awesome Sweet Potato Chocolate Chunk cookies. Tough act to follow, but I’m willing to try. My cookies are going to Jen at So Simple Gluten Free with Jen. You may recognize Jen from her work with the Gluten and Allergen Free Expo, or her So Simple Gluten Free Recipes app. Jen is one busy and talented lady! I hope she enjoys my cookies, and I hope you enjoy the recipe. Preheat oven to 350°. In a heat-proof bowl, melt the chocolate over a water bath, stirring frequently. When fully melted, remove from heat. With an electric mixer, beat in the almond butter and sugar. Add the coconut oil in chunks, and beat until coconut oil melts into the dough. Add vanilla and salt. Beat in the eggs 1 at a time. The dough will come together and look like frosting. Beat for 2 minutes after the second egg is added. Stir or beat in the coconut. Using a cookie scoop, drop mounds of dough onto parchment-lined baking sheets. Bake for 12 minutes. Do not over-bake! Cookies will still be soft. Allow to cool for 10 minutes on the cookie sheets, and then slide the parchment off the cookie sheets and allow to cool completely before moving. The cookies will firm as they cool. *Note: I have used as little as 1/3 cup palm sugar + 10 drops of stevia. If you use the smaller amount of sugar, your cookies will be less chewy and they won’t spread. The larger amount of sugar makes for a cookie with chewy edges and softer interior. If you use palm sugar, it’s helpful to give it a quick whiz in a coffee grinder after measuring. 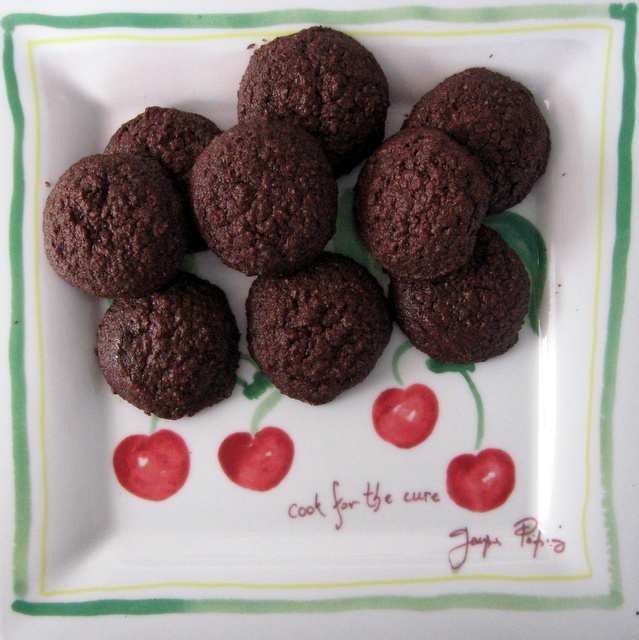 This entry was posted in Blogger Community, chocolate, coconut, cookies, desserts, grain-free, nuts and tagged chocolate, cook for the cure, cookies, recipes. Bookmark the permalink. Chocolate AND coconut ! Sold!!! Judging by your name, you’re vegan, yes? I haven’t tried these with an egg replacement. That was next on my list of things to do. If you get to it first, let me know how it goes! I know I commented quickly via facebook but wanted to let you know how much everyone loved these. I did 1/3 sugar and no stevia because we just don’t do things very sweet anymore and I felt I could have even cut it to 1/4. My company was my son’s coconut loving friend and her mom for dinner. I had doubled the recipe and got called out for a game of catch with my little neighbor so I spread the remaining batter in a pan and stuck it in the oven as I pulled out the trays. Drop cookies and bar cookies were both wonderful. Coconut girl loved them and so did her mom. Next night our oldest and his wife came to dinner – I held the pan back for that dinner. Again, biggest hit. I’ll be making this one again soon. Love the Pass the Plate idea! It’s snowy and wet here today, and I have no cookies in the house. I think I’ll be making these again. Maybe I’ll try them in bar form myself this time!